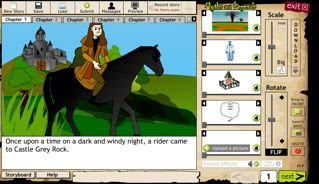 Here's a great site where kids can find out about myths, legends and folk tales. Myths and Legends is one of the East of England Broadband Network sites. You can read all sorts of stories there, including many written and created by children. And that's the exciting part for me - Myths and Legends encourages kids from all over the world to publish their own tales. You can choose the site's own clip art and backgrounds for each page, and use them to help create your story. A great feature is being able to add sounds like axes thudding and bells ringing, or record your own sound effects and add them. Once you start the story creator, it brings up a dashboard where you can choose your background for the first scene. Clicking the eyeball under the top sidebar frame shows you options, and clicking on your choice pastes it onto your first page. Text goes in the space under the background. Characters, props and speech bubbles are all available in the sidebar, and there's a tool to make items smaller, flip, delete etc. The visual side was easy but I took a while to work out the sound effects. As usual though, any six- or seven-year-old would have no trouble at all! Kids can listen to stories being read aloud, while they follow on the screen, as with this story about the origins of Humpty Dumpty. There's also a page of teacher resources, including hints about making storyboards and using Movie Maker 2. It's well worth exploring the site; it truly is a great literacy resource for kids. I made my own story. It's called Jack and Slicer Go For a Walk. (Yes, okay, my axe took on a personality of its own!) You can find it on the Myths and Legends page of saved and published stories. Be sure to roll your mouse over the art work to hear my fabulous sound effects. Next time, I'll make one with full audio track. Once a story is created, if you want to save it, you are prompted to register. I didn't have a school, so I chose "other" as my option. If you have a youngster who, like me, might be interested in creating his own story about croaking ravens, baying hounds, beasts, blood puddles and ghastly screams, or even one who isn't into gore, check out Myths and Legends. The Myths and Legends is a great site. What I particularly like about it, apart from the fact that you can read and create your own stories, is that it is a strictly moderated site and is therefore safe for children (of all ages) to use! web spaces that encourage kids to read, write and create! this is wonderful I love anything that involves tid bits of history and facts and fun. Thanks! Me too Lucy - well, particularly the fun part! Recent blog post: Ban Read-Alouds? Ban the Bureaucrat!